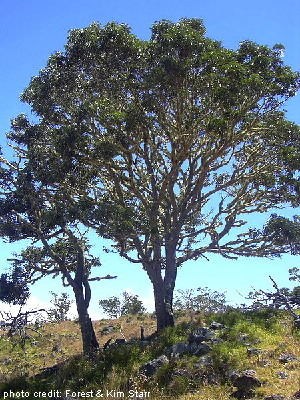 Koa, the best known of Hawaiian woods, grows year round and can reach heights of 100 feet. The specific gravity is around .55, making it similar to American Black walnut in density. 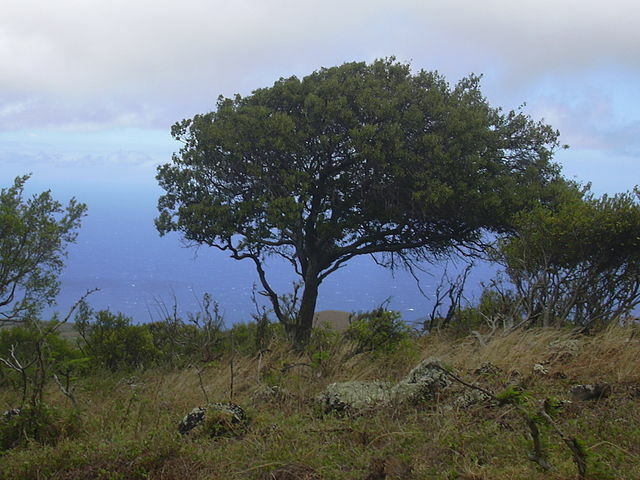 It has been used for centuries by Hawaiians to make wa'a (dugout canoes). 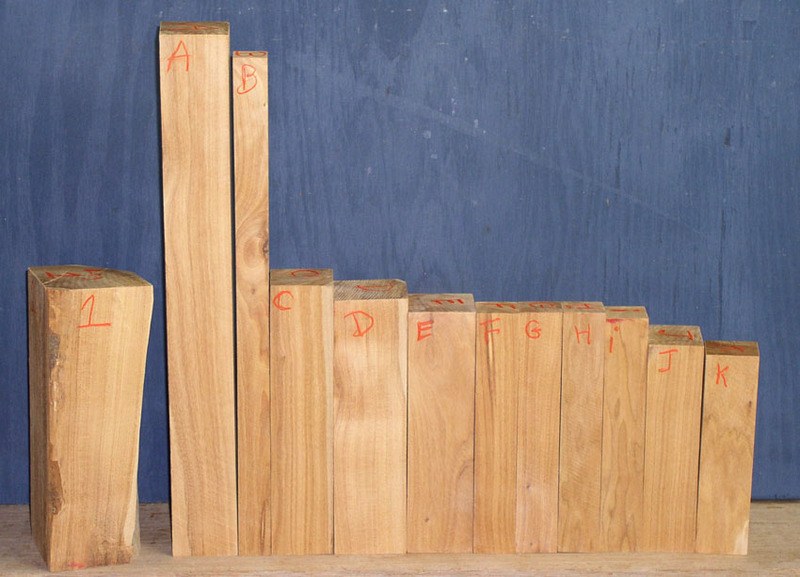 It is a great wood for many purposes including musical instruments, bowls and all kinds of projects where a medium weight wood can be used. 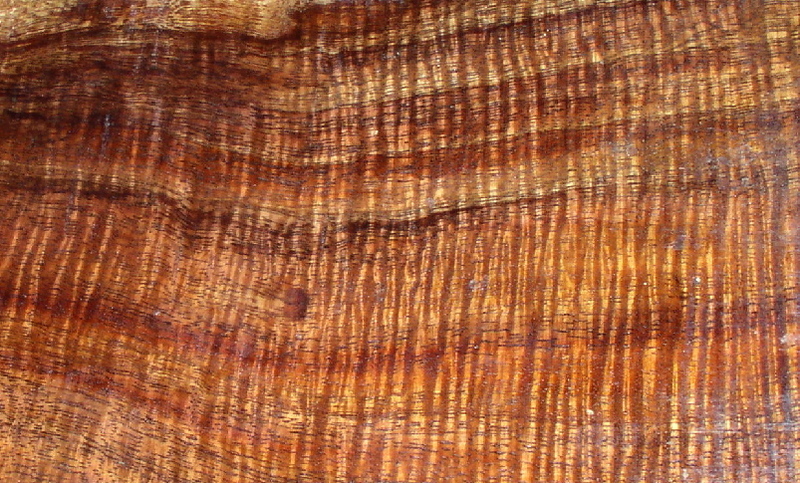 Our figured Koa has the beautiful chatoyance in the curl seen in the photo above, and the distance between curls vary (the one above has very tight, close curl). 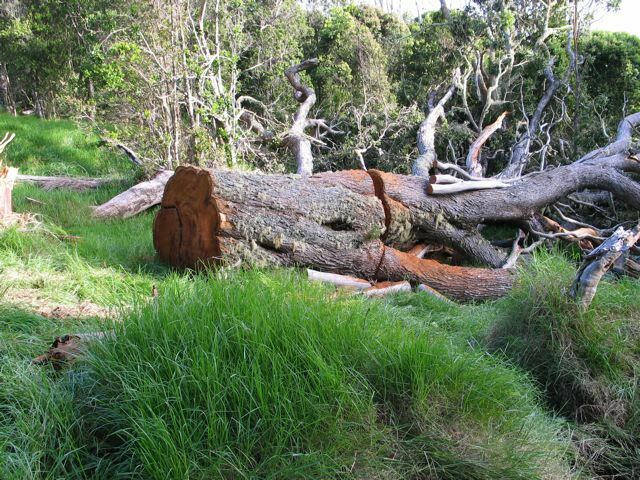 All of our figured wood comes from the stumps of dead or dying trees, havested legally on private land. As best we can tell, it is not classified as endangered. The biggest threat to Koa in Hawaii appears to be overgrazing of cattle. Click here for a larger detail of the Koa photo. Macadamia wood now on this page below the Koa. Click the photo for another view of these. Actual pieces shown, order by number below. Pieces not listed below are sold. 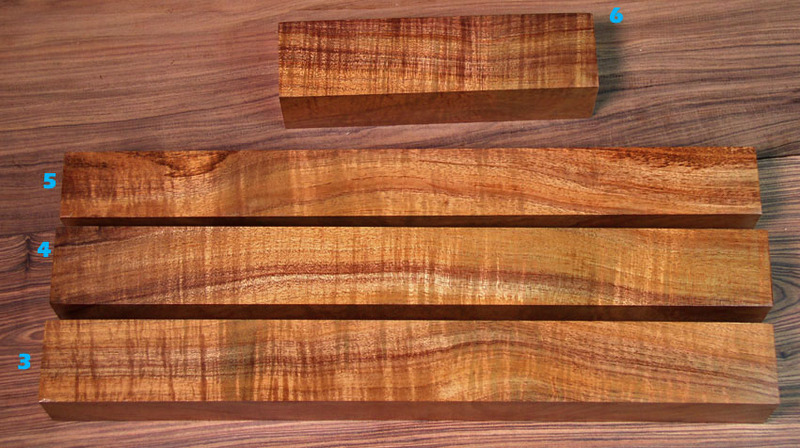 NOTES: These are the higher density koa. 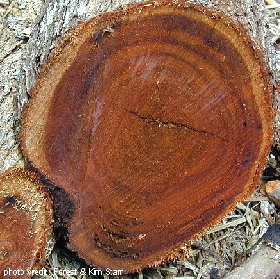 They were cut from older trees and you can feel in your hand that the density is a bit higher. Pieces 3,4,5 are on the line between gg and gg+, Piece 6 is GG+. 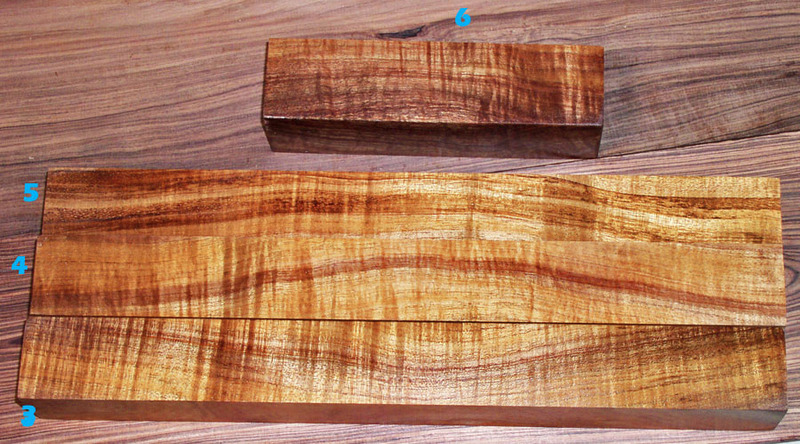 Hawaiian sandalwood is very rare, and few have the opportunity to own this wood. 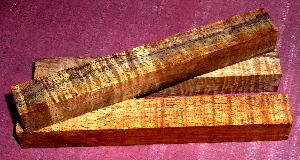 The quality of our pieces sold here is equal to the best East Indian Sandalwood as far as aroma. 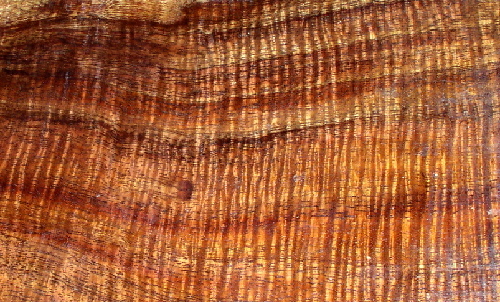 Grain is quite fine and the wood takes fine detail very well. 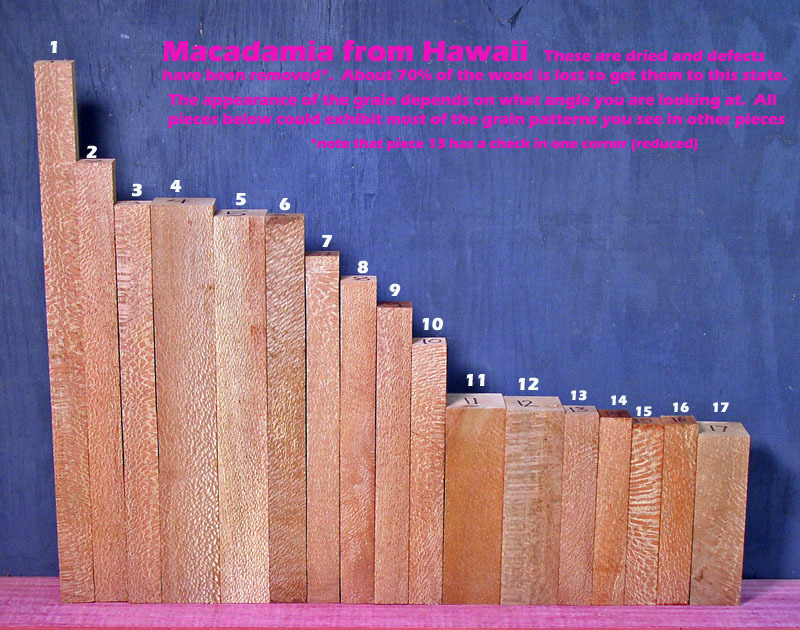 Even in Hawaii, few individuals have been able to use this wood for woodworking as it is almost never sold. Ours was legally obtained from a private landowner who needed to remove a dead tree in the past and kept these pieces to sell. 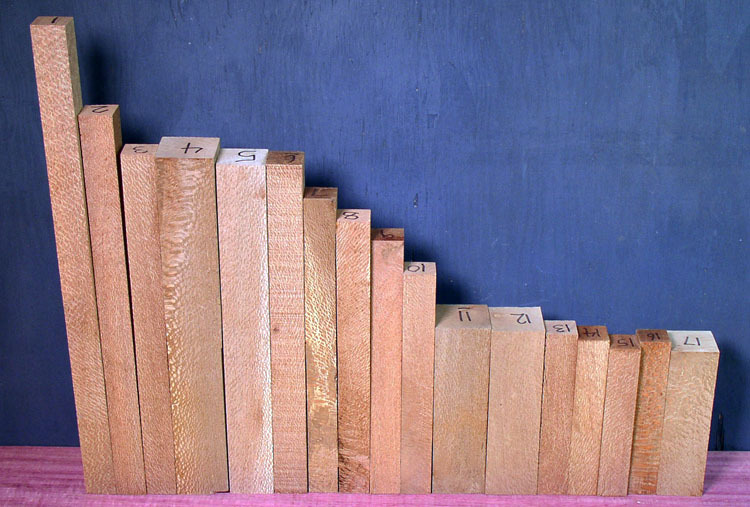 This is the rarest wood we sell. We have had inquiries from a museum in Hawaii because they cannot obtain it anywhere in the islands. It is available in other small sizes for .80 per gram and little log sections (with defects) for .30 to.60 per gram. Once we sell our current stock, we doubt we'll ever be able to get any again and consider it a once in a lifetime find. Please be aware that even the best sandalwood is not like a bottle of perfume. It won't fill a room like an air freshener or even be noticed by people who have trouble smelling subtle smells. (Some individuals cannot even smell a quart of paint thinner spilled in the rug of a closed up 85 degree room---as I have witnessed with surprise!) 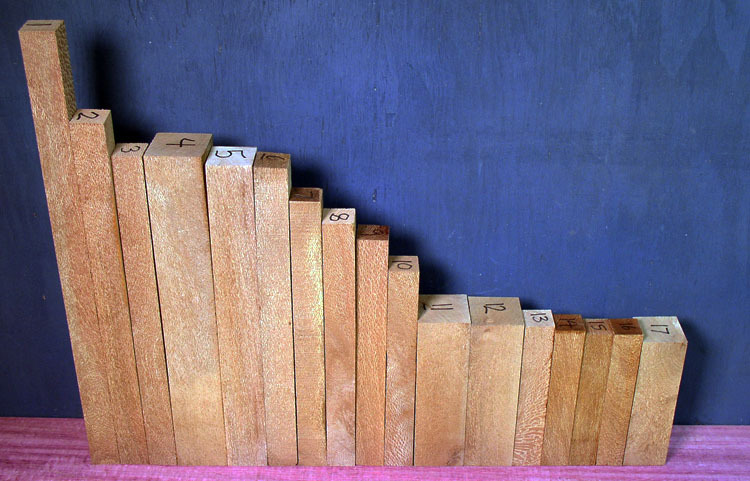 Most people can smell it very well when bare wood is held up to their nose at room temperature. Cold temps or very high humidity might decrease the smell. It can fill a room if properly used as an incense, or when it is turned on a lathe. 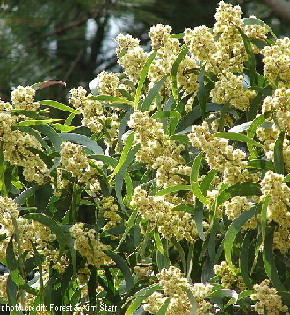 These are top grade for aroma in sandalwood--as good or better then any sandalwood from India. NOTE: you CAN export these from the USA! 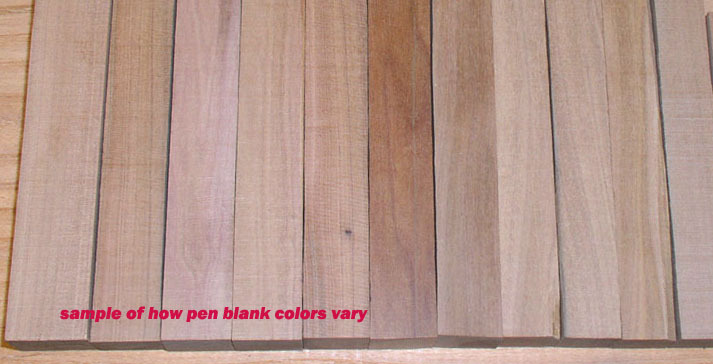 The above photo shows the range of colors in the pen blanks listed below. 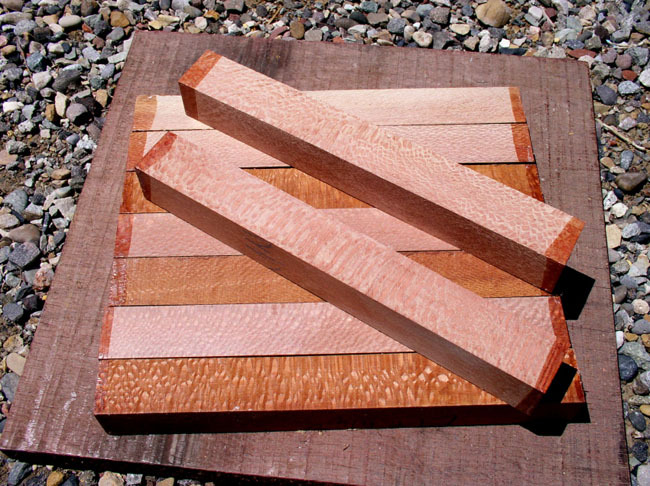 They are all pretty similar and there is little/no sapwood in them. Outstanding aroma in these, you will really fill the shop when you work on them! Note: Just a few available in most sizes. If we run out of your size, let us know and we'll cut more for you. Click the photo for the second side. 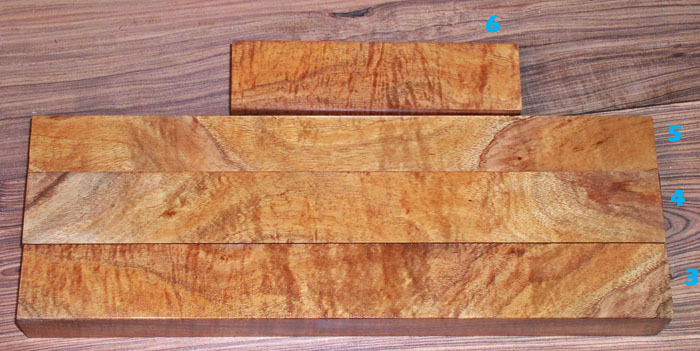 Top quality defect free pieces*, cut from the highest quality logs, aroma is outstanding with a high oil content. Extremely rare wood basically unknown on the market. They smell great and you'll love these if you like sandalwood. Probably a once in lifetime find. 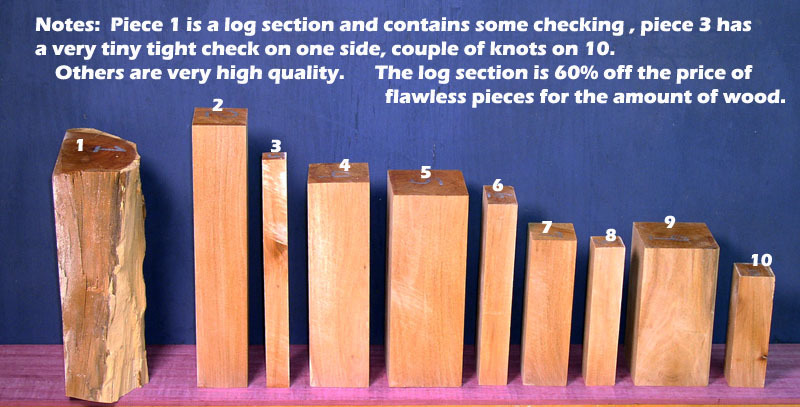 Notes: *Piece 1 is a log section and does have typical defects like checks/cracks and is sold at 60% off the price of the other pieces which are defect free. Piece 3 has a small tight hairline check and piece 10 has knots, both reduced. Click the photo for the second side. 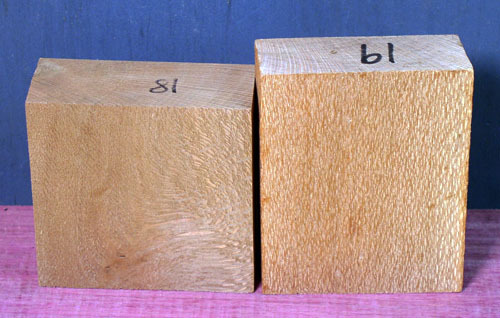 Top quality defect free pieces*, cut from the highest quality logs, aroma is outstanding with a high oil content. Extremely rare wood basically unknown on the market. They smell great and you'll love these if you like sandalwood. 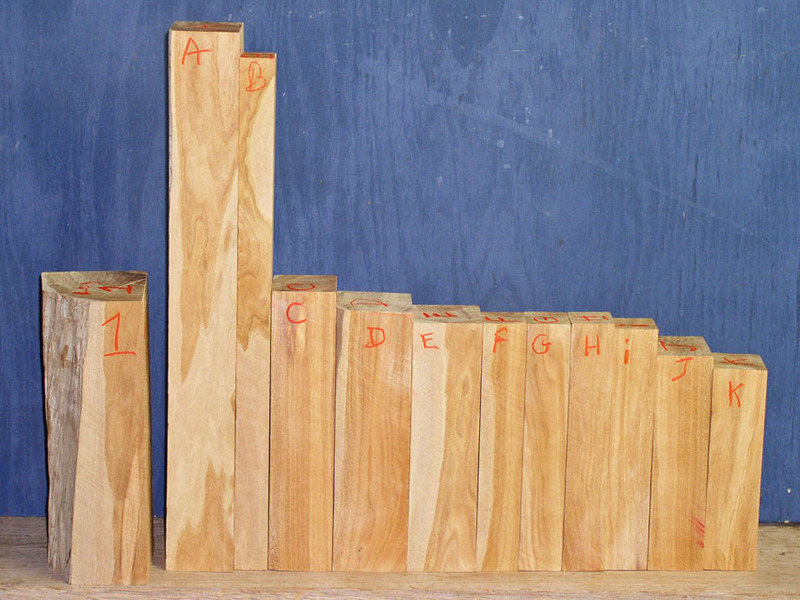 Notes: *Piece 1 is a log section and does have typical defects like checks/cracks and is sold at less than half the price of the other pieces which are defect free. Click photo for side 2. 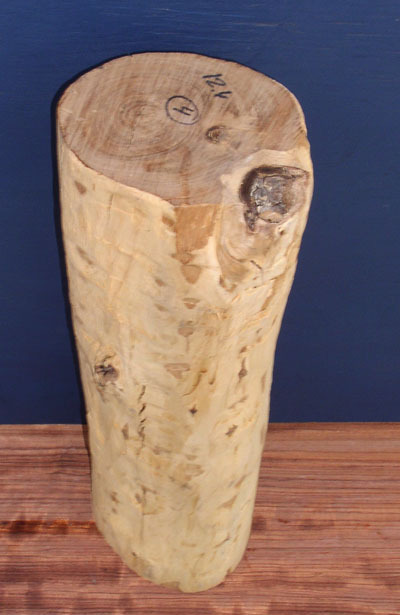 A log with excellent aroma, also has many fewer checks/cracks than normal, making it excellent for carving as well as incense. Length of 18.25 to 18.5 inches, widths range from 4.75 to 5.5 inches. 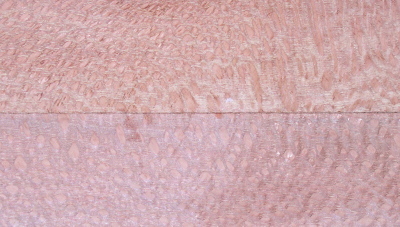 Macadamia wood has an appearance much like lacewood/leopardwood, but has a pinkish cast and slightly different markings. The color can look like red stain with a finish. 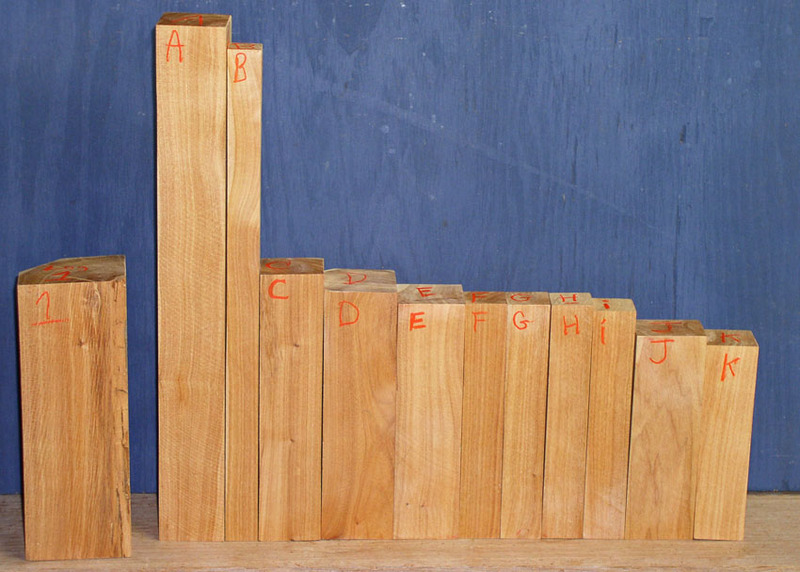 Just like lacewood, the appearance of the markings changes based on the angle the wood has been cut. 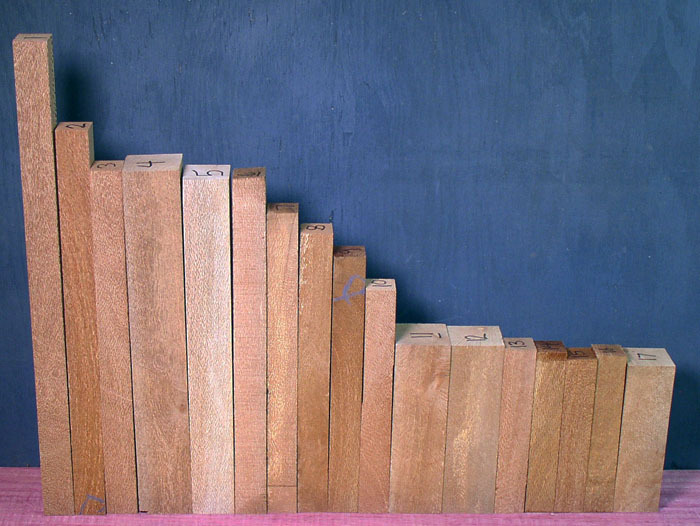 The wood often develops multiple defects when drying, which makes it very important to buy truly dry wood. These pieces have been kiln-dried completely. 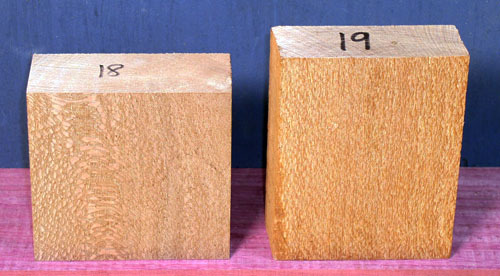 as soon as the piece is sanded, the lighter color is apparent. Sample photo of typical pieces. Click the photo for the second side. Nice clean dry pieces. This wood is incredibly hard to dry without cracks going everywhere. Fortunately, once dry it seems stable. Picking the best pieces to start, we have to buy about 4 pounds to get one pound of blanks. Click the photo for the second side. Nice clean dry pieces. This wood is incredibly hard to dry without cracks going everywhere. Fortunately, once dry it seems stable. Picking the best pieces to start, we have to buy about 4 pounds to get one pound of blanks. Pieces missing below have been sold. Widths wider then 1.75 are hard to produce. 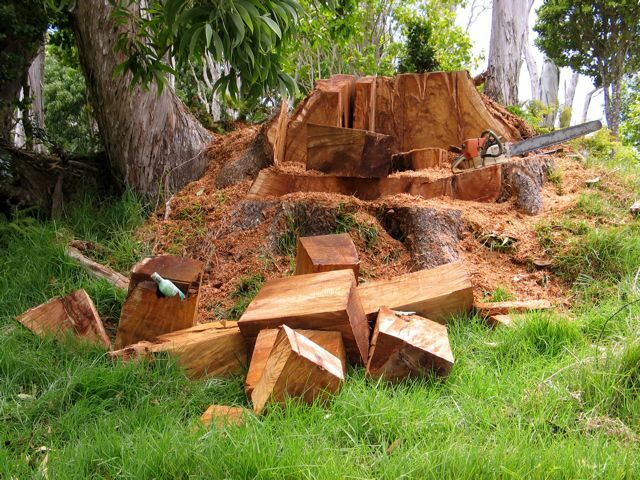 Koa: A dead/dying tree being harvested legally on private land. 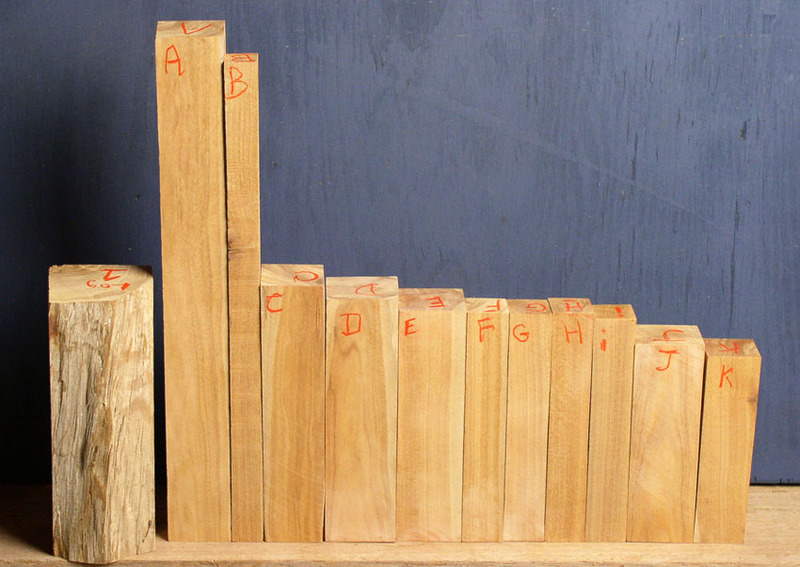 Koa: Getting some of the figured wood, usually lower on the stump. on this page can be used without permission by getting them from the Wikipedia article on Koa..